One of the most important gymnasium's in the world. 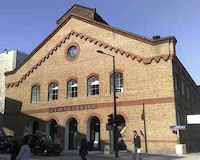 Description: This is the German Gymnasium - one of the first purpose-built gymnasiums in England. It was designed by local (Stoke Newington born) Edward Augustus Gruning. It cost 6000 and was funded by the German community in London, hence it's moniker. It was built over 1864-65 for the German Gymnastics Society and went on to be pivotal in the development of athletics in Britain. In its first year it attacted 900 members, of whom 500 were German. The National Olympian Association held the indoor events of the first Olympic Games here in 1866, and these games continued annually at the German Gymnasium until the breakthrough White City games in 1908. The immense timber roof trusses, still with their original cast iron hooks from which budding Olympians swung from ropes, are still in place today. The German Gymnasium closed at the outbreak of world war I and then it was used as offices and storage by various railway companies, until its restoration by Argent in 2008. The Gymnasium is still being restored to its former glory and will be home to a contemporary restaurant venue soon.